Dr. Miller serves as professor of medicine and epidemiology and public health at the University of Maryland School of Medicine. In addition, he is director of the Center for Preventive Cardiology at the University of Maryland Medical Center and staff physician at the Veterans Affairs Medical Center in Baltimore. His major research interests are disorders of lipid and lipoprotein metabolism, molecular studies of low HDL cholesterol, triglycerides and the postprandial response to dietary fat, and clinical trials of atherosclerosis prevention and regression. Special interests include family history of heart disease and emotions and heart disease. He is certified by the National Board of Medical Examiners and the American Board of Internal Medicine, with a subspecialty certification in cardiovascular disease. Dr. Miller is a fellow of the American College of Cardiology and the American Heart Association Council on Arteriosclerosis. He is also an active member of the American Society for Preventive Cardiology and the American Heart Association Council on Epidemiology. Dr. Miller has published more than 250 articles, book chapters and abstracts. His research has appeared in prestigious scientific and clinical journals such as Arteriosclerosis, Thrombosis and Vascular Biology, Circulation, Journal of the American College of Cardiology, Journal of the American Medical Association and Proceedings of the National Academy of Science. His most recent book, "Heal Your Heart: The Positive Emotions Prescription to Prevent and Reverse Heart Disease," is available for purchase online. Dr. Miller is the co-author of The Practice of Coronary Disease Prevention, published by Williams and Wilkins in 1996, and is a contributor to the Adult Clinical Cardiology Self-Assessment Program (ACCSAP 2000). In addition, Dr. Miller is the senior author of a book, AMA Guide to Preventing Heart Disease, and, in 2009, was listed by USA Today as one of the most influential physicians in the United States for the diagnosis and treatment of cholesterol disorders. Dr. Miller received his B.A. degree from Rutgers College and his MD from The Robert Wood Johnson Medical School in New Jersey. 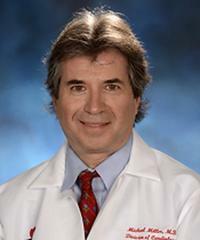 Following a medical residency at the University of Cincinnati Medical Center, he completed two fellowships at The Johns Hopkins Hospital in Baltimore, one in lipoprotein metabolism and the second in cardiovascular disease.